Hello, have I baked up something delicious for you? 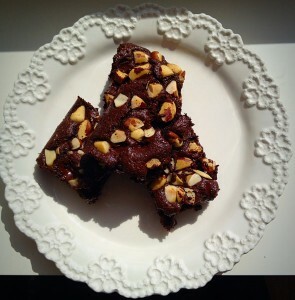 If you love Chocolate and Brazil Nuts then you will be Nuts About Brownies! 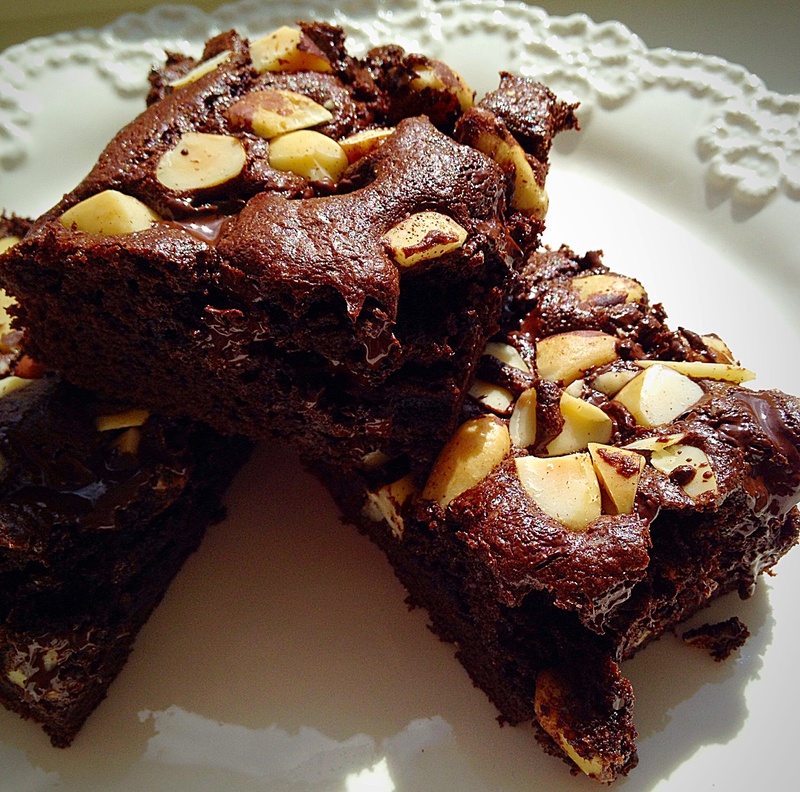 Brazil Nut studded, fudgey Chocolate – you will love Nuts About Brownies! 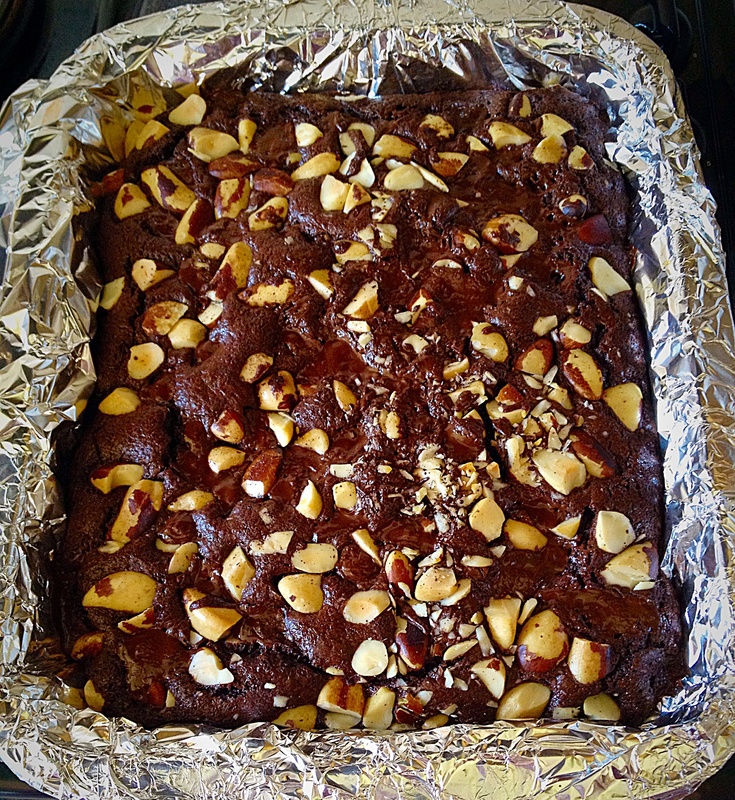 This Brownie recipe is so easy as it’s all made in one saucepan. Come on we so love a recipe that doesn’t involve a mountain of washing up? Not only that, you line your baking dish/tin with foil – so even that stays clean! Anything to make life easier is very welcome around here! Go big or stay small, each bite is chocca full of nuts! Nigella is the inspiration behind this recipe. I’ve tinkered with it a little bit and I’d like to think she would approve. 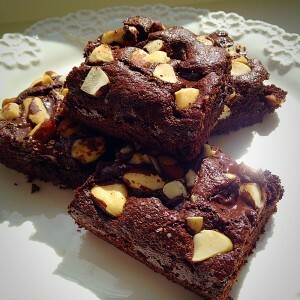 I’ve used Brazil nuts in these Nuts About Brownies, but Walnuts and Pecans work very well too. Whatever nuts I add, these Brownies disappear very quickly in our house!!! 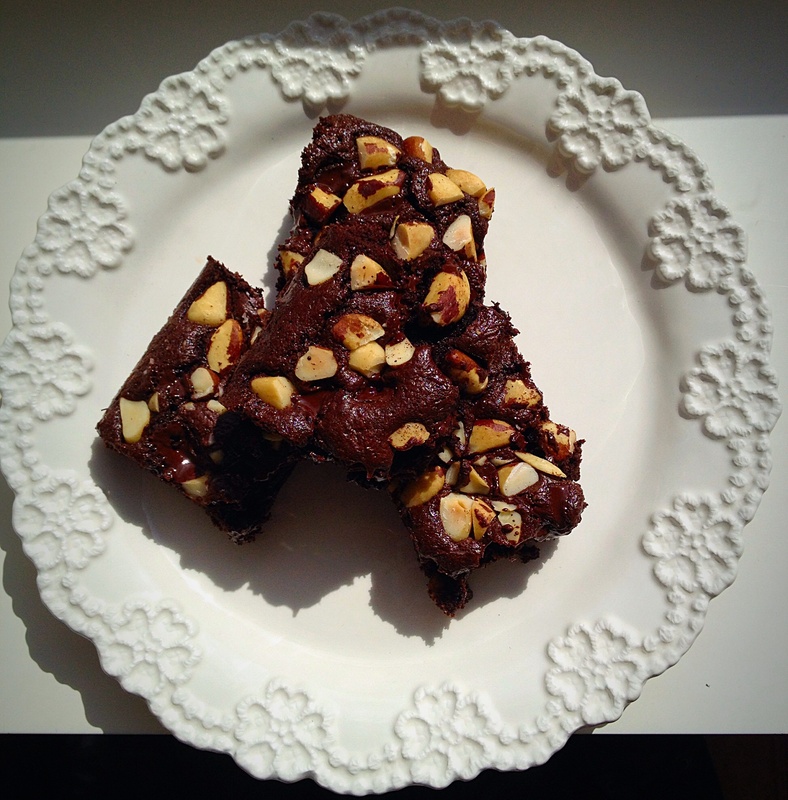 I’m Nuts About Brownies – are you? Preheat oven to 175C/160C fan. Line a 30cm x 20cm (12″ x 8″) baking tin with aluminium foil. Ensure the dish is at least 5cm (2″) deep. 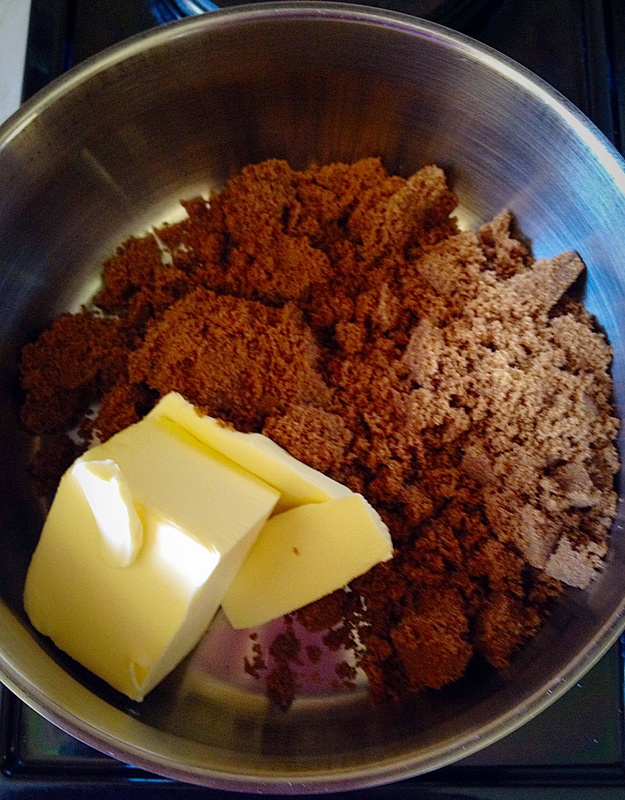 Melt the butter and sugar gently over a low heat. Add the cocoa to the melted butter/sugar, off the heat. 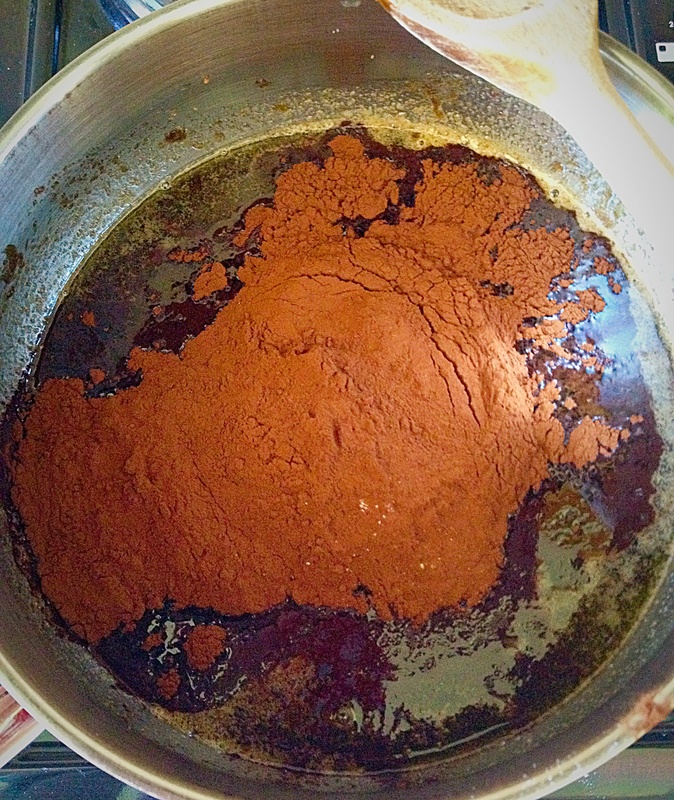 Stir in the cocoa until thoroughly combined. Now add the flour, bicarb. and salt. 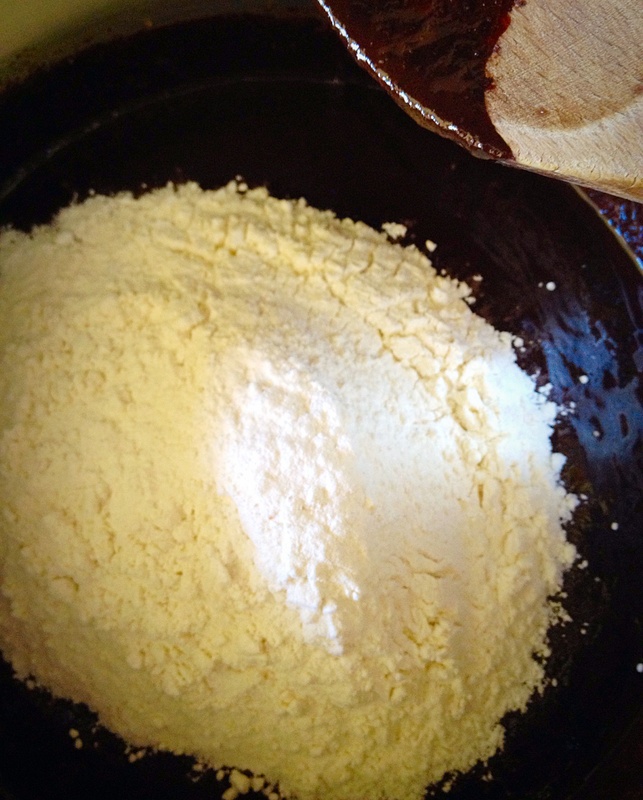 Mix thoroughly – the mixture will be quite dry and claggy at this point – don’t worry!! Crack the eggs into a jug. Add the vanilla extract and mix – don’t whisk as you don’t want to incorporate air. Add the egg/vanilla mixture to the cooled contents of the pan. 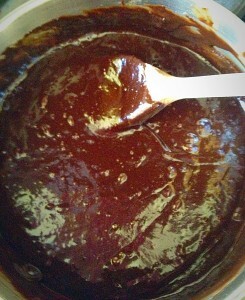 Mix thoroughly, until you have a smooth, silky, brownie batter. 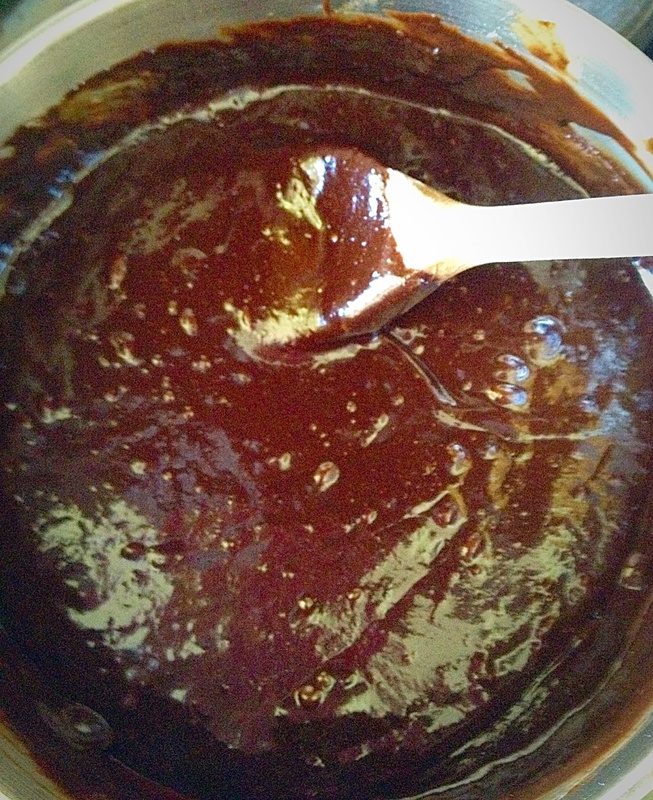 Pour the brownie mixture into the foil lined tin. 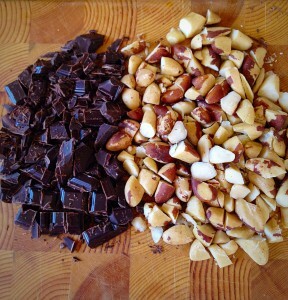 Chop the nuts and chocolate into large chunks. 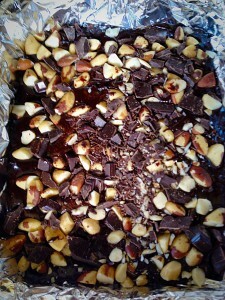 Sprinkle the chopped nuts and chocolate evenly over the top of the brownie batter. Now the next step is important but might sound a bit odd – rap the baking tin hard against the worktop 3-4 times. 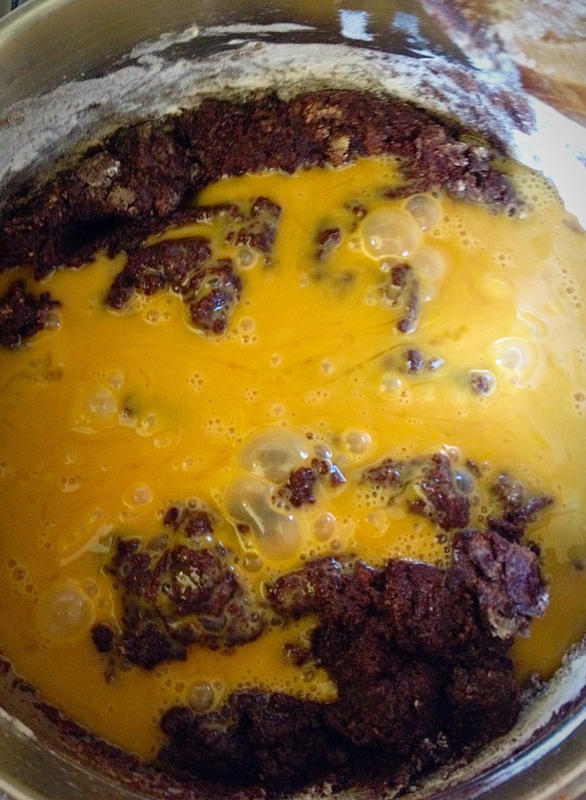 This brings any bubbles to the surface, we want our brownies to be dense and fudgey, not light and airy like cake! Rapping the tin also settles the chocolate chunks and nuts into the batter. 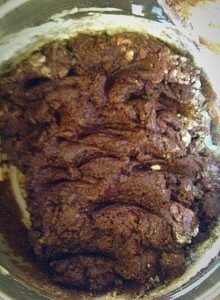 Place the brownies in the oven and bake for 20 minutes. 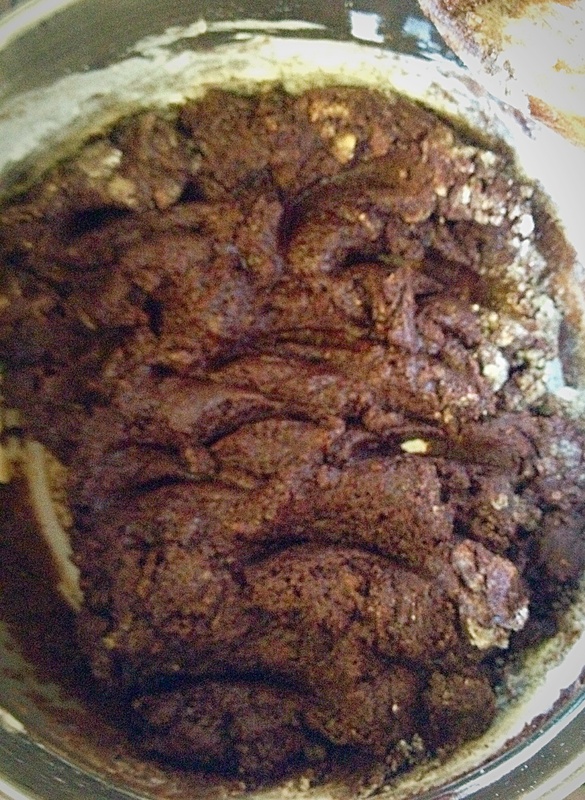 The brownies are cooked when the top is set, but there should still be a little bit of wobble in the middle. Remove from the oven and allow to cool in the pan for 30 minutes. 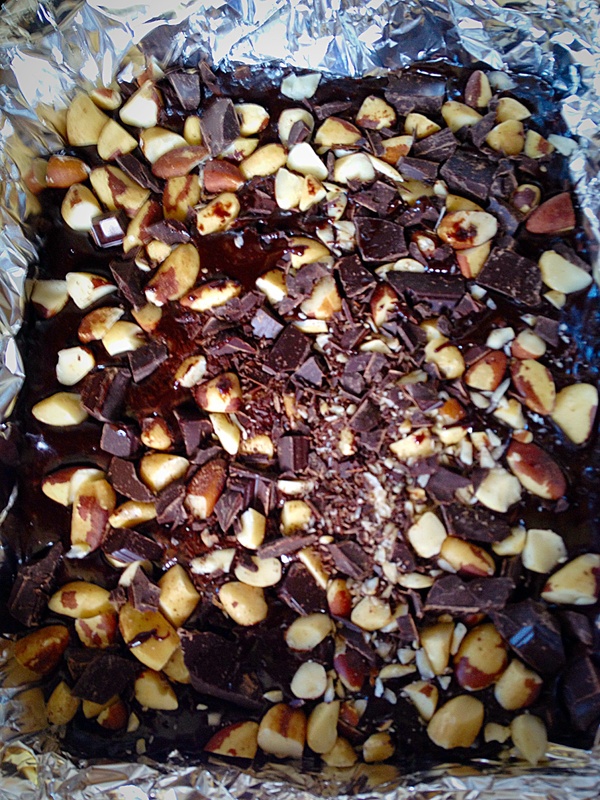 Your Nuts About Brownies are nearly ready to eat!! 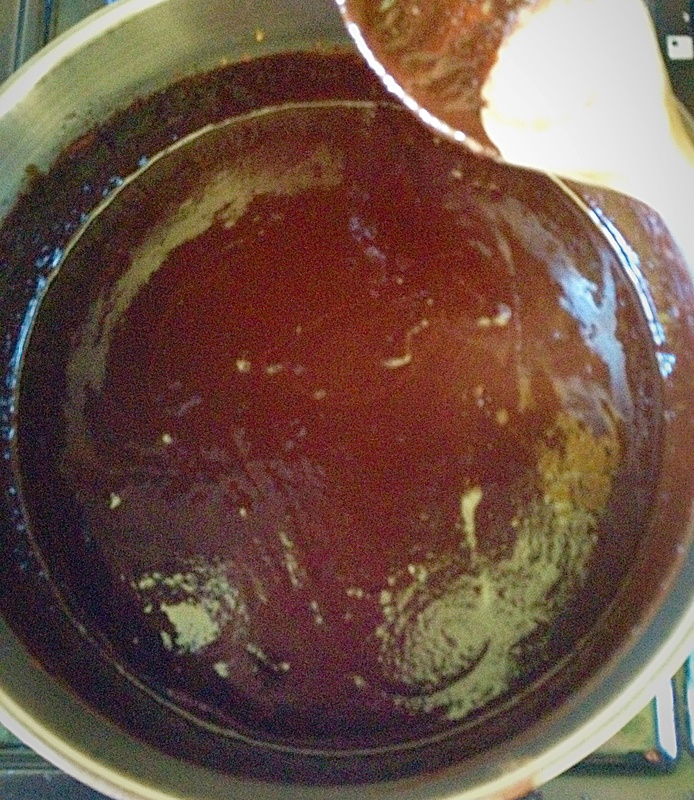 Remember it’s always better to slightly undercook them, that ensures fudgey, gooey, yumminess!! Remove the brownies from the tin by simply lifting out the foil. 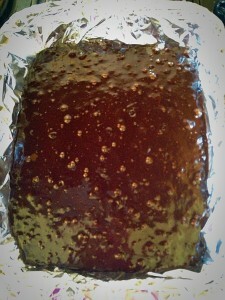 Place on a cooling rack, pulling the foil away from the sides of the cooked brownie. Congratulate yourself on one less item to wash up!!!!! Once cooled cut into squares. 9 big ones or 15 smaller ones. 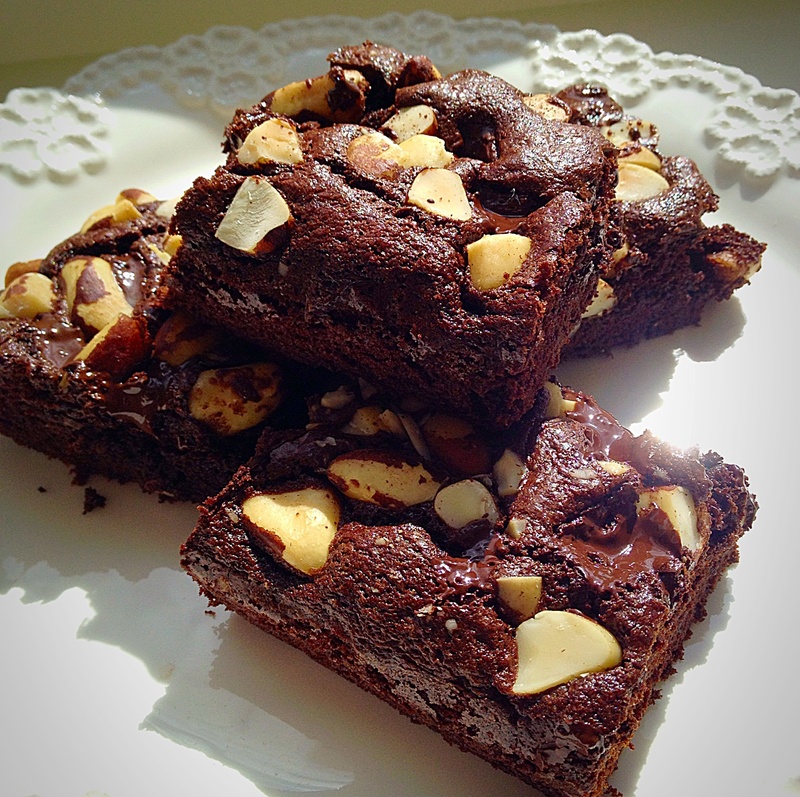 Pour yourself a large glass of milk and get ready to taste Nuts About Brownies! 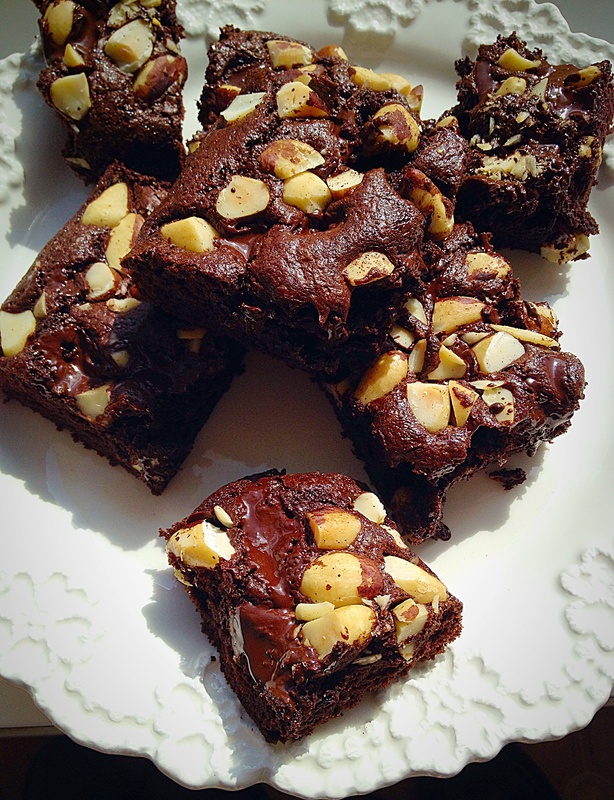 These brownies are so simple to make and bake. 30 minutes from start to taking them out of the oven – perfect for when you have a chocolate brownie craving! Or is it just me that gets those??? 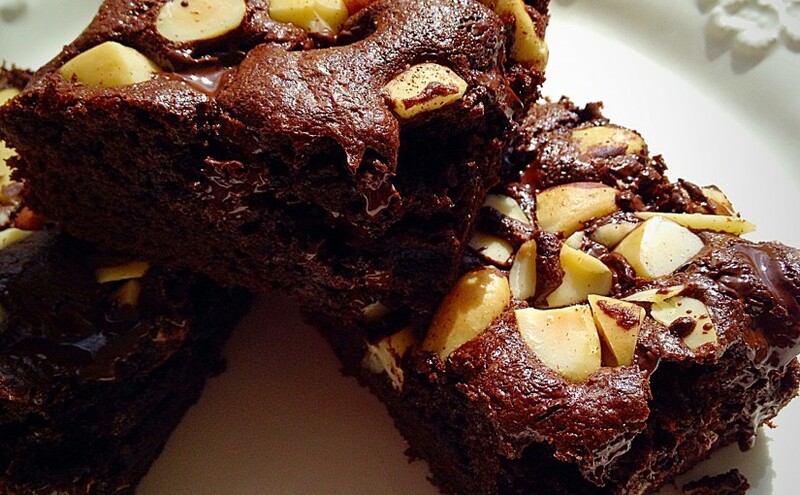 Brownies are perfect for sharing. Would you share your brownie? What foods are off limits when it comes to sharing? These look DELICIOUS… If only I could cook! 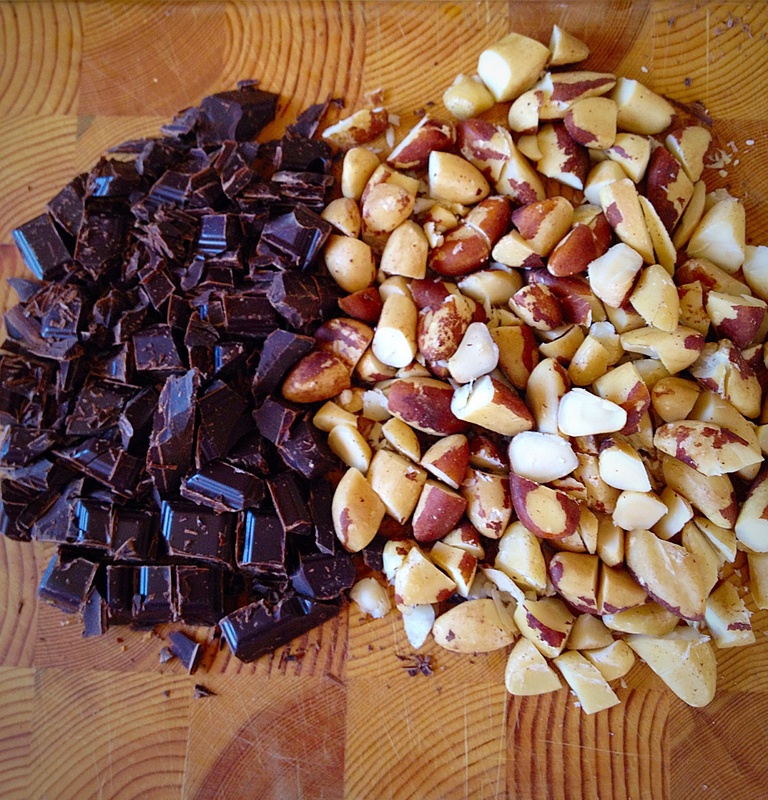 I love that you used Brazil Nuts, they’re my favorite!! Thanks Alice, they’ve almost all been eaten!! This seems to be delicious, I wish I had a little bit! Thanks, I love all nuts, but popping them in brownies, cookies and cakes is a good way of getting the children to eat them! Ah thanks Caitlyn. They are delicious and you can add different nuts, walnuts are particularly yummy! 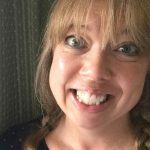 Please let me know how you get on if you do try them? Fantastic Caitlyn, I hope you’ll love them.